It was yet another night of battling with sleep. It was weird having a hard time falling as sleep, since my bed was so comfortable, and the pillow I had is big and fluffy. I fell asleep almost at 3am and woke up before my alarm sounded at 9am. The only plan I had for the day is to do my laundry and to possibly watch a movie. The first order of the day, is to go online. It was lucky that I did because I got an e-mail from Ming, inviting me to lunch near his office in Silom. I quickly replied back and we made plans to meet outside his building at 11:30am. I dilly-dallied online some more, before finally prying myself in front of the computer to get ready for lunch. Silom was about thirty minutes on the BTS. From Sukhuvit, I boarded the train at Thong Lo station in the Sukhumvit line, got off at Siam station to change to the Silom line, and got off at the Saladaeng station. I underestimated my travel time, and I was 10 minutes late. Lunch don’t really start until 12 noon, but there was a reason Ming wanted to meet up early. We walked down Silom and crossed the street, going into this small street lined with stalls selling food and other items an office worker might need. We came upon a market that has stalls selling clothes and other goods in one section, and great Thai food in the other. This market is one of the places frequented by office workers from around the Silom are. 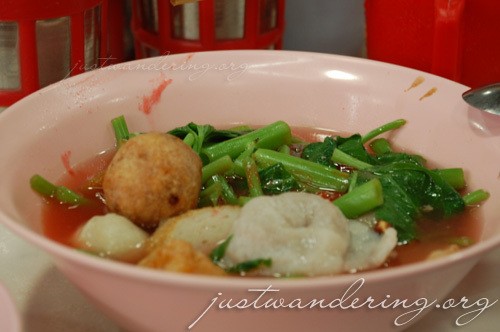 Like most food courts in Thailand, each stall has its own specialties. Some specializes in noodles soups, chicken rice, roast duck, and of course, pad thai. After checking out the food offered by the stalls, we settled on pad thai and oyster cake. 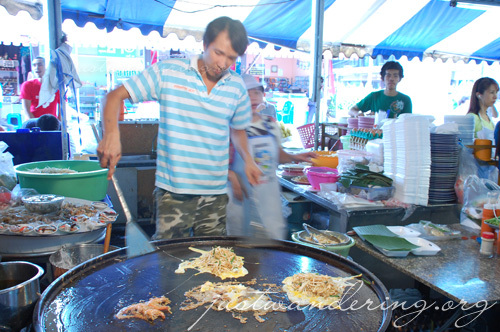 It was a joy watching the guy cooking the pad thai and the oyster cake. He had this big gridle and a pair of spatulas with long handles. Ming ordered pad thai with shrimp, and the guy put a bit of batter in the griddle, then put the shrimp on top. 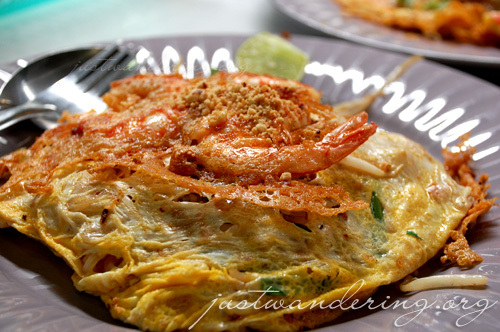 To cook the pad thai, he cracks open an egg, and in one fluid motion, he has the egg on the griddle and with a flick off the wrist, the shell goes flying into the waste bucket on the floor. He breaks the yolk and swirls it around a bit, then put the noodles on top of the egg. Then, he folds the egg, like it was an omelet, scoops it up to put in a plate and places the shrimp on top. The ingredients for the garnish are on the side table, and you just pick whatever you want to go with your noodles. It was the same with the oyster cake. He’d put a batter on the griddle, then add the seafood. Let it cook for a bit before flipping, then brown it just enough before scooping it out to put to a plate. Both the pad thai and the oyster/seafood cake was divine. It was seasoned just rigth, and it was a great meal for someone who’s not really into spicy food. To go with the meal, I had a very cold glass of Thai milk tea, perfect for the venue, since it can get pretty warm inside. Lunch wasn’t over yet though, and Ming ordered two more plate, this time, two kinds of rice. 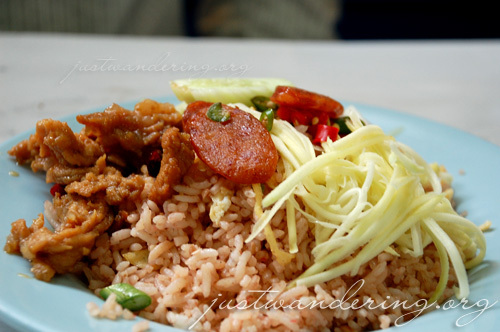 I said I wanted to try the shrimp paste rice, since it’s reminiscent of home, so Ming got one plate of that. He also bought a plate of curry rice that comes with chicken and this yummy jelly-like sauce. Both items were another hit. Still, lunch wasn’t over, and we headed to the market’s annex where Ming’s favorite noodle shop was. 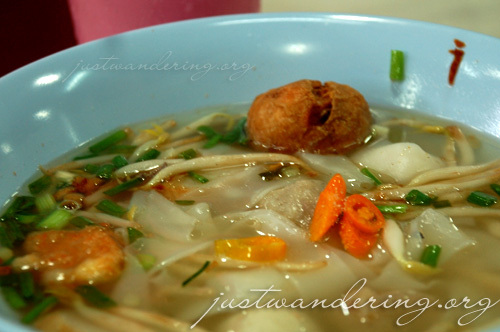 I was already full, but I’m interested to try this noodle that a lot of other Thais seem to be so fond of. Ordering can be a bit tricky though, as you’re supposed to write down your order in a piece of paper provided in each table. It has to be written not just in the Thai language, but also in their script. There’s a bit of a wait for our soup, as the shop’s area was crowdeed. The first to come to our table though, was this unimpressive bowl of pork bones and shredded meat. One sip of the broth and I was hooked. 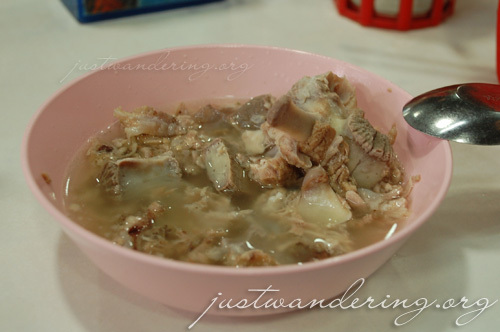 It was just a simple broth made of pork spine, boiled for several hours and seasoned only with a bit of salt and pepper. The taste is purely meat. The bits of pork that was in the broth were all so tender and packed with flavor. Soon, the bowls of noodle soup arrived. In this shop, Ming said, you can customize your bowl: you can choose what kind of noodles you want (or none if you prefer), what kinds of fishballs to put in, the kind of soup. The soup base was the delicious broth. The other variation to this was the red soup, which has some ingredient that turned it red and gives it a different flavor. The fishballs were also quite good. Each one was different, and each has its distinct flavor. Red soup without noodles, so it gets more veggies. The best thing about this lunch? Each plate only cost around 40 baht. I was so full from lunch that I wanted to do nothing more but to take a nap. I scrapped the plan to watch a movie, and headed back to the hostel. I didn’t nap, though. I went up to the 5th floor, and loaded my laundry in the hostel’s coin operated washing machine. The receptionist said a load usually takes 40 minutes, so I set my phone’s alarm clock and went down to go online. Of course, the problem when I go online is that when my alarm goes off, I just press snooze. I eventually made it back up to the laundry area after an hour, and was surprised that one of the housekeepers hanged up my now clean clothes to dry. That was really sweet. Unfortunately, it seemed like it was going to rain. I let my clothes dry some more, before taking it off the clothes rack and bringing it down to my room to dry. The wind was blowing pretty hard at the rooftop, though you can hardly feel it inside the hostel. Soon, rain started pouring in earnest, which ruined my plans of going to the street’s night food market to take photos. Every evening, various food stalls set up at the entrance of Soi 38. They offer good and cheap food for those living and working in the area. This is a great perk for staying at HI-Sukhumvit. The rain didn’t let up until past 8, and it was only until 9pm that I was finally able to get out of the hostel for dinner. 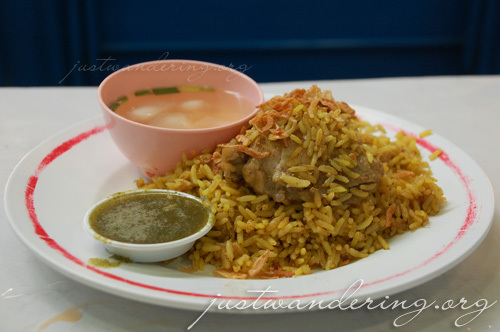 For only 50 baht, I had a great chicken rice meal and a bottle of water. I’m so happy I found this hostel! will be in bangkok with friends in september. do you remember how to get to this street? can you tell us the street name or how we can get there from Silom? we’re using your blog as research material for our vietnam-cambodia-bangkok backpacking trip! keep ’em coming. thanks! The food is mouthwatering. Thanks for the info. We will be sharing this with the Pinoy Daddy Readers. This will be very informative for those who have plans of travelling to Thailand. I am still craving for Thai food!!!!!!! Everything looks yummy. Makes me wanna go back to BKK to try em. I can count the number of times I ate Thai food in Manila the past couple of years. 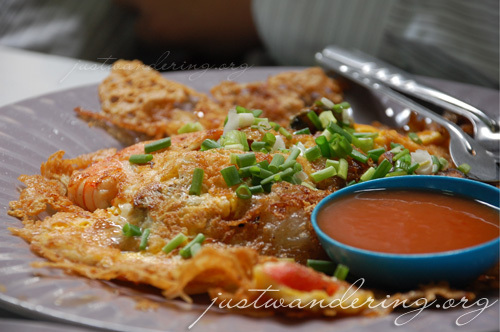 My favorite was SR Thai in Katipunan when I was still in college. Not sure if they’re still there or if the quality is still the same. Research mode na to! you take really pretty photos of food! I need more practice to get to that level. You really do inspire us!